A good quality and very practical, 19th century English mahogany Shop display cabinet of simple lines. 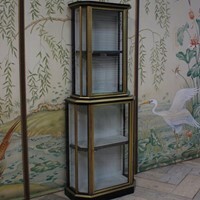 The cased display cabinet with four adjustable glass shelves and mirrored back. The door opening at the back. The cabinet retaining the original label.